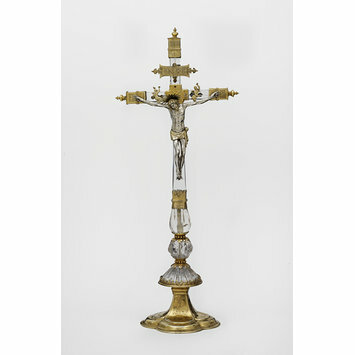 Silver-gilt and rock crystal, raised, engraved, gilded, cast and carved. 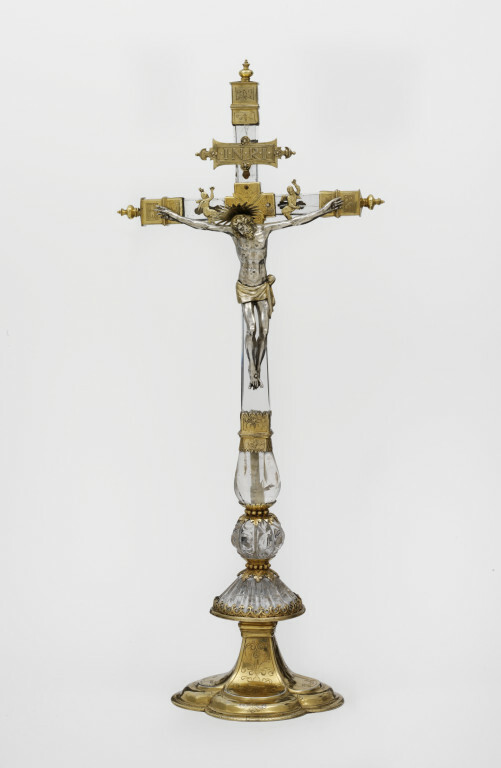 The cross is formed of sections of rock crystal, mounted in silver-gilt. The foot, mounts, cherubs on the arms of the cross and the plaque above Christ's head are all gilded (probably re-gilt); the figure of Christ is parcel-gilt. The mounts are engraved with simple designs of flowers and foliage; the foot of the cross is shaped as a quatrefoil. In the four lobes at the base of the cross, a simple symmetrical floral and leaf pattern alternates with a simple pattern of interlace. Round the edge of the base are simple strapwork motifs; the rim of the foot has a punched dot design which imitates matting interspersed with a simple strapwork motif. The figure of Christ and the plaque at the head of the cross may be later (1615-20); the two small cherubs may also be later additions. Stamped on the plaque attached to the vertical shaft of the cross, above Christ's head. Pinecone in a circle-shaped punch. Assay mark for the town of Augsburg, for the years 1580-90. Stamped in one of the lobes on the base of the cross. A ?plant with three stems, each with a flower, growing on a low mound, in a circle-shaped punch. Probably the maker's mark of Paul I Kleebühler (d. 1623). Stamped next to the town mark in one of the lobes on the base of the cross. Zig-zag assay mark on the underside of the foot ring. Nothing is know of the early history of this object. The cross was purchased from Mr J. Lowe of Wardour St, London, in 1910 for the sum of £150. Silver-gilt and rock crystal, German (Augsburg), 1580-90, town mark of Augsburg and maker's mark, probably Paul I Kleebühler, punched on foot. Seling, Helmut. Die Kunst der Augsburger Goldschmiede, 1529-1868: Meister, Marken, Werke. Munich, Beck, 1980. ISBN 3406057292 (set). position on the altar for the service of the mass. The body of the cross is made of a highly prized and rare material, rock crystal.